It will be helpful to list very clearly the differences between the accounts of the Nativity in Matthew and Luke. Joseph finds Mary to be with child. 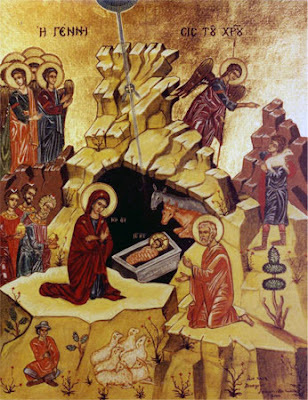 Joseph hears of the Incarnation from an angel. The Magi, led to the Child by a star, adore him. This occurs in a house in Bethlehem. They return to their land without telling Herod. Joseph takes Mary and the Child and flees to Egypt to avoid the Slaughtering of the Innocents. After Herod’s death, being instructed by an angel, Joseph takes his family and returns to Israel, going to Nazareth in order to avoid Herod’s son. The angel Gabriel announces the Incarnation to Mary. Mary visits Elizabeth and remains with her for three months before returning to Nazareth. On account of the census called by Augustus, Joseph takes Mary to Bethlehem. The Child is born in a stable in Bethlehem, because there was not room at the inn. The shepherds, beckoned by an angel, come Christmas night to worship the Child. On the eighth day, the Child is circumcised and named Jesus. About forty days later, Jesus is received in the Temple by Simeon and Anna. After their betrothal, but before Mary came into the house of Joseph, the angel Gabriel visited the Virgin and delivered the joyful news of the Incarnation (March 25th). At this point, Mary and Joseph both lived in Nazareth, this is where all these events took place. Joseph was not present and did not immediately learn of the Annunciation or the conception of the Child. Again, before Mary came into the home of Joseph, she visited her kinswoman Elizabeth and remained with her for three months (at Ein Karen, near Jerusalem). Most of the Church Fathers are of the opinion that Joseph was not present at the Visitation – up to this point, he knows nothing of the Incarnation. After staying with Elizabeth for three months, Mary returned to her home in Nazareth. Upon Mary’s return, either from her revelation or simply from careful observance, Joseph discovered that Mary was with child. He intended to divorce her quietly, but the angel told him in a dream that he need not be afraid to take Mary into his house. At this point, Joseph received the Virgin into his home. About six months later, in the ninth month after the Incarnation (December 25th), Joseph and Mary traveled to Bethlehem (near Jerusalem) on account of the census. It was here that the Christ Child was born. Jesus was born in a stable, because the inn had no room. That very night, the shepherds came and saw the Child as well as Joseph and Mary. Eight days later (January 1st), the Child was circumcised and given the name “Jesus”. This seems to have occurred in a private home, rather than in the Temple. It took place in Bethlehem. On the fortieth day after the Nativity (February 2nd), Mary came to the Temple for her purification. It was at this time that the Simeon and Anna recognized the Messiah. Shortly after this, the angel appeared to St. Joseph and told him to flee to Egypt. It was after this that the slaughtering of the Holy Innocents took place. Several (but less than twelve) years later, after Herod had died, Joseph, having received the instruction of the angel, returned to Nazareth. It was in Nazareth of Galilee that Jesus grew to adulthood. Thanks for this helpful article. I think modern scholars make too much of the differences as though they were conflicts. They can, as you have well done be lined up pretty well. One detail you mention about the star appearing only the night of the nativity is new to me. Where does this detail come from? Great article, but the patristic writings on the subject agree that the genealogy in St. Luke's account is not St. Mary's, but the biological genealogy of St. Joseph as opposed to the legel one that St. Matthew provides. It seems very unlikely to me that St. Luke would provide St. Mary's genealogy. One of the characteristics of a conspiracy theorist is that he or she will pick at the details to try to find a contradiction, and then claim the event is a conspiracy. This seems to be how doubters in Jesus' Mysteries, like His Nativity, act. Not to call them conspiracy theorists. "But others say that the star first appeared when Christ was born, and that the Magi set off as soon as they saw the star, and accomplished a journey of very great length in thirteen days, owing partly to the Divine assistance, and partly to the fleetness of the dromedaries. And I say this on the supposition that they came from the far east. But others, again, say that they came from a neighboring country, whence also was Balaam, to whose teaching they were heirs; and they are said to have come from the east, because their country was to the east of the country of the Jews. ..."
I hope that this helps, Thomas does not say which Fathers hold the position I have espoused..it is the opinion which St. Thomas seems to hold, for he writes "and I say this". Blessings to you, good father! In my commentary in the present article, I follow Cornelius a' Lapide, who in turn follows St. Jerome. St. Jerome holds that Heli (who St. Luke calls the father of Joseph) is in fact Joachim, the father of Mary. Joachim had apparently adopted Joseph at some point. But Joseph and Joachim (Heli) were also related, so the biological genealogy of Mary (and of Jesus) would be very close to the genealogy of Joseph. For this reason I state that Luke secretly gives the genealogy of Mary (which is Jesus' biological genealogy) and that Matthew gives the genealogy of Joseph (which is Jesus' legal and royal genealogy). Hence, Matthew's genealogy would be Joseph's biological genealogy (and Jesus' legal), while Luke would give Joseph's legal genealogy (and Jesus' biological) -- this is the reverse of what you have found in your reading of other Church Fathers. I hope that this explains the point well enough. Obviously, there is great room for diversity...so long as we say that Jesus is both legally and biologically the descendant of David, and also hold that the two genealogies are not in contradiction. @Nick, You are right on! But we need not fear those who seek to prove the Gospel false, for Jesus will come again and will bring his reward with him! In his CD titled "Searching the Scriptues: The Gospel of John" (Catholic Lighthouse Media) Steven Ray points out that Matthew wrote to a predominantly Jewish audience and as such, portarayed Jesus as the Davidic king. Hence his geneology started with Abraham and led to Jesus through David. Luke on the other hand, wrote to a predominantly Greek audience and as Greek culture and philosopy stressed perfection and beauty, Luke portrays Jesus as the perfect man. Luke's geneology therefor goes back to the perfect man, "Adam, the son of God." Mark was written to a Roman audience. Romans respect speed, power and percision and so Mark goes immediately to the miracles. John portrays Jesus as God and hence the first three lines of Johns Gospel, "In the beginning was the Word, and the Word was with God and the Word was God" is Jesus's geneology. Father, where does the information about the Blessed Virgin making/desiring to make a vow of virginity come from? As far as I'm aware, there's nothing explicit in the Gospels. As for the implicit information in her words "since I know not man", a simple reading (in English) is that this is just a statement of her virginity, not necessarily implying a vow. Is there something in the original language that more strongly suggests a vow? Thank you in advance. When I say that Mary took a vow of virginity, I do not intend that she made a vow in the sense of a promise before a priest of the Temple or anything like that. What I mean to suggest is that she promised virginity to God, by an explicit choice -- and that Joseph witnessed this, and promised chaste continence as well. What tells us this? When Mary says "since I know not man", she is not merely implying that she has not known a man yet; rather, she is making a more absolute statement. It is not "I have not yet known man", nor "I do not now know a man", but "I know not man". Remember, Mary was betrothed to Joseph. When she hears that she is to be with child, she would naturally think that the child would be Joseph's...if their marriage was to be a natural marriage. But she knows that the child will not be by Joseph, because she "knows not man" -- she has vowed virginity. Moreover, it would be highly unjust for her to make such a decision without Joseph's approval -- hence, we can conclude that she expressed her desire (to be a virgin) to St. Joseph and that he ultimately affirmed this and accepted her vow to God of virginity (likewise, he then was accepting his own 'vow' to chaste continence). It is for this reason that the translation (found in the RSV of all places), "I have no husband", is simply unacceptable. It is, "since I know not man", or "since I do not know man", or (at the very least we can take the NAB) "since I have no relations with a man". I hope that this helps. I should also say that the interpretation I give here is that followed by the majority of the Fathers and Doctors, so we also have the support of the Tradition. For more info, see my earlier post from December 18, "Did Joseph suspect the Blessed Virgin Mary of sin?" One objection to the harmonizing of Matthew and Luke's Nativity accounts is that Luke says nothing about the flight into Egypt or the Magi but rather tells us that after Jesus was taken to the Temple the Holy Family returned to Gallilee. The implication being that the return was immediate. How do we explain this to those who make this objection? Hence, I would say that, if we read Scripture carefully, and don't make conclusions beyond what the text is actually saying, we can harmonize the various accounts. Luke simply leaves out the flight into Egypt, because he is telling us more what was in Mary's heart. Matthew tells must more about Joseph's story, so the flight to Egypt is brought up and dealt with extensively. We can reconcile the accounts by saying that, after the Presentation in the Temple, the Holy Family did return to Nazareth. Then Joseph received the warning from the angel and they fled to Egypt (returning before Jesus was 12 years of age). I hope that this helps! Ultimately, if the critic does not have faith, he will probably never be satisfied...the problem is not really intellectual, but usually moral.